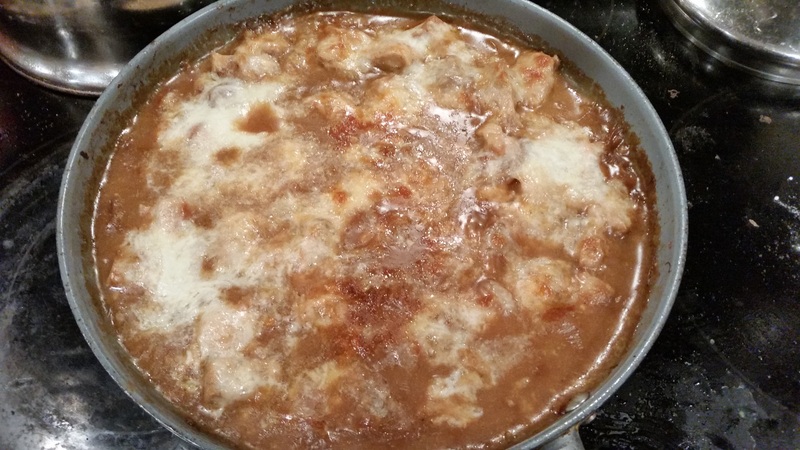 Chicken with French Onion Soup Gravy and a Plea for Kindness – What's for Dinner Moms? I had this post all ready to go when something happened. I thought it over for awhile and decided I needed to take a moment to respond. This is my blog. Hence I choose what is appropriate or inappropriate based on my opinions. I like healthy, productive discussions but above all I expect myself and you, my friends, to treat each other with respect and dignity. I made a comment on a post two years ago that was a recipe very different from what I cook about how delicious it looked and that I would need to try it some day. A troll decided two years later to come find me. At first I was hurt and shocked. Then I took a moment and realized how small and insignificant this person must feel to do this two years later! They don’t know me or anything about me and felt the need to attack me for no reason. I had to look at the 19,000 comments on this page and remember that 1 person is statistically insignificant. But, it is amazing how quickly we focus on the one not the thousands when it is something negative. I want my blog to remain open and positive. I hope you all do the same. I will not approve mean spirited comments towards my readers and if one slips through please let me know. Healthy discussion or debate is good, pure hatred is not. Now that that is over – Don’t get scared when you look at the time it takes to make this dish. Most of the time is spent caramalizing the onions, which can take 30-40 minutes depending on your pan and the amount of onions you are cooking. You want them to cook super slow and over low heat to get the really sweet taste that will make this taste like French Onion Soup Gravy. You only need to stir once in a while while cooking the onions so you can do other things in your kitchen like maybe organize that junk drawer. This was a terrific dish. I had to keep my self from eating the Balsamic Onions while the chicken was cooling. They smelled so good. Even my son who is not a huge fan of French Onion Soup said he liked it. Score one for Mom! This can be served over French baguette slices (which sops up the gravy), egg noodles or rice. We prefer the bread because it lends itself to the French Onion Soup feel. If you can use Swiss cheese, Provolone cheese or mozzarella, or any combination of those cheeses you wish on top of the dish. I served this with a green salad and a green vegetable to complete our meal. In a large oven safe skillet over medium low heat mix the onions, 1/2 the olive oil and a sprinkle of salt until onions are well coated. Allow to cook, stirring occassionally to keep from burning, until onions are well browned – about 25-40 minutes depending on your pan and the heat of your stove. The longer they cook the sweeter they will be. Once they are golden stir in balsamic vinegar and cook stirring constantly for 2 minutes. Remove onions from pan. Add remaining olive oil and chicken to pan and increase heat to medium. Sprinkle with salt, black pepper, and thyme. Stir to coat chicken. Allow chicken to cook until browned and cooked through. Remove chicken from pan. Increase heat to medium-high and add beef stock to pan and deglaze pan. Stir up all the little brown bits at the bottom of the pan for the best flavor. Stir together corn starch and cold water until the corn starch has dissolved (this is called making a slurry). Add the mix to the beef stock and bring to a slow simmer. Stir well until a gravy is formed. Preheat oven to 350 degrees. Add chicken and onions back to pan and stir well. Remove pan from heat. Sprinkle top with cheese. Place skillet in oven for 10-12 minutes until cheese is bubbly and slightly browning around the edge. Remove pan from oven and allow to rest for 5 minutes before serving. To serve, if desired, served over sliced baguette, egg noodles or rice. Trolls are the worst! Some people aren’t happy unless they are spreading negative thoughts! This dish looks awesome and I’m sure I would be dipping into the onions too! I’m saving this! Have a happy day Marci! I thought I should tell you this because our history go back years here and I consider everyone here part of my blog family and friends. There is paid professional trolls now working the internet in political and news blogs to disrupt the discussions and control the discussion toward their ideology. What it has done is made it Ok to troll all over the internet where it used to be just in the chat rooms and news feeds. That is a great idea for the use of caramelized onions. I bet that would be good over other meats. Thanks for sharing and giving the heads up on trolling. Thank you. How awful to have paid political trolls! What have we come to to bully one another for money. Thank you for writing from your heart! Never mind the one who was unkind…we’ve all had them. And you’re dead right about what you say. Well done! Thank you! I was mad at myself for how I allowed one person to make me feel that I was less than. I always see myself as stronger than that. That looks delicious and I will be making this in the near future. As for trolls, they are generally very unhappy people. I am so sorry that you were the target of one :(. Thank you, Lynn for your kind and encouraging words! Mwah! Lol! I tjink it would be perfect ad no one has manners in the on line world or in real life any more. Thanks! I’ve been blogging long enough that I have had experiences like yours. I had a similar reaction, too, and stopped writing for a while. Then I realized that if you do that, then the malcontents have won. I – we – can’t let that happen. Keep on blogging and don’t be bothered with the grumps. Thank you for your words of wisdom. I agree with everything. I love french onion soup and this looks drool worthy !!! Thank you! 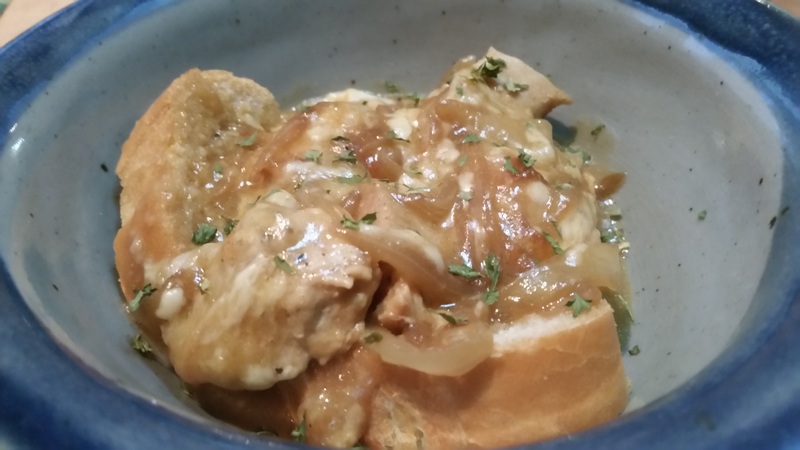 We loved the bread in the bottom soaking up the onion gravy! We can’t let the minority of numskulls ruin our blogging experience! Thank you, Marci! Yes! Thank you so much, Sylvester! It is unbelievable how one single incident or person can throw us off track. Most of all when we are not able to understand what their motivation is. How pitiful after two years to showing frustration about a nice comment. However, I had a “friend” almost from my blogging beginning for two years. Then he misunderstood a comment I made. I tried to explain but he wasn’t willing to listen. He put me under moderation and even started posting against me. Later I found out that I wasn’t the only one being treated that way by him. I saw his blogging motivation and his posts in a different light all of a sudden. He only did/does it for having his ego caressed. We definitely mustn’t let one troll under thousands of angels dim our joy for blogging! Big hugs, Marci!! Thank you, Erika. How very sad that a “friend” would do that to you. It is amazing what havoc one negative person can do in our positive days. Yes, it was very disappointing and scary to see his true face. Then again, I was glad to have clarity about the cause of the problem. Right, it is crazy that something weighs heavier than all the wonderful things around. I even wrote a post about it once. I would have shared the link but don’t know the title anymore… lol!! I’m so sorry you got trolled, but it’s best to ignore them. They feed off of response. However, let me tell you this dish looks fantastic! Thank you for both comments! Thank you so much! You ate so right about the troll. I actually feel bad for them. Thank you! It set me back for a minute but realizing how sad and small they must feel to have to behave like that I realized says more about them than me. Wow 2 years later? That’s for sure their issue. Yes! Thank you. I think that is what set me back for a bit. Why dig through that? Very much in favour of kindness and positive comments on blogs. Hey, it makes you feel better about yourself too, so it’s not entirely selfless! Also very much in favour of onion gravy. And anything with cheese, so a win-win recipe here. It is so sad when someone does that. I am off Facebook because of social network bullies and have been away from computers for sometime but then decided to try my shot at blogging and getting back on. It is a process but my daughter and I are having fun doing this together. One of my favorite things is discovering all those other bloggers and everything they share with us…wow there is a lot, and I love all the recipes and DIY and travel adventures. Love your blog, thank you for sharing. Thank you so very much! It helped so much stepping back and putting it in perspective that it was about them not me. Glad you are having fun blogging with your daughter. What a fun thing for you to do! You have always been so kind & gracious on my blog – keep your head up (NO ONE deserves trolls!) Reading the recipe made me drool!!! Thank you so very much! Hope you had a wonderful holiday!